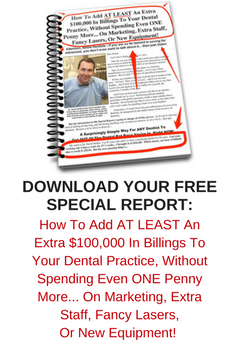 In my 36 page Special Report I explain in detail how I was able to increase my Dental Fees a whopping 78 percent over an eight year period. And it’s simply just a matter of using the Pareto Principle, and applying it to your Dental Office. We all know *OF* the Pareto Principle. It’s commonly called the 80-20 Rule. The Pareto Principle, named after economist Vilfredo Pareto, states simply that for many phenomena, 20% of your invested input is responsible for 80% of the results obtained. Or, to put it simply, 80% of consequences stem from 20% of the causes. 80% of your income comes from 20% of your customers. Conversely, only 20% of your income is generated by the remaining 80% of your customers. Also, 20% of your time generates 80% of your income. Similarly, a whopping 80% of your time is spent generating the remaining 20% of your income. How’s this? The “difficult” 80% of your patients produce only 20% of your income. And the pleasant 20% of your patients produce 80% of your income. So how can we use the Pareto Principle to help us build and create the Dental Office of our dreams? I’d contest that by doubling your fees you’d eliminate a far greater percentage of your problem patients. What I found, as I gently increased my fees on a regular basis over an eight year period was that with each gentle increase a smaller percentage of my more difficult patients would decide to go elsewhere for their dentistry. So over time, the fee increases resulted in a “cleansing” of my patient database. As the eighty percenters started to reduce in number, the number of top twenty percenters began to grow to compensate for those patients departing. And so my collections grew disproportionately relative to the size of my patient base. Excitingly, the regular fee increases also resulted in me attracting more new clients who were more like the top twenty percenters of my patients. A lot of dentists out there are fearful of upsetting those eighty percenters. They’re fearful that one whining patient will be upset and leave their practice and go elsewhere. When that sort of fear is your driver, I’m here to tell you that *YOU* are not in control of your practice. Sadly, your practice is controlling you. I used gentle fee increases to crush this anachronistic paradigm and send it packing. In an average part of Sydney. With average patients earning average incomes living in average sized homes and driving average cars. Beverley Hills it was not. Double Bay it was not. I was able, through gentle regular fee increases, to not only keep up with inflation but to get ahead of inflation and rising costs so that I had full control of my own destiny. I was able, through this process, to attract and keep more clients like my top twenty percenters and dramatically grow my collections and my profits. I didn’t invent the 80-20 Rule. However, it’s a very sound Principle to consider and apply to make sure that your Dental Office does not stagnate and go backwards. It’s use and application are imperative if you are ever to build the Dental Office of Your Dreams. The Dental Practice website is often the first port of call for new patients looking for a new Dental Home. And with the amount of information out there about dentists, it’s now easier than ever before for the consumer to make a well informed decision as to whether or not she is going to start going to this Dentist, and why she is *NOT* going to be going to that Dentist. Without even having picked up the phone. And without having ever set foot outside of her own family home doorway. The problem with most Dental Office Websites is that they’re not written with Mr. and Mrs. Joe Public in mind. In the first instance they’re often written to impress the Dentist who owns the Dental Office. Because they’re often written by him. “So What!” the consumer is saying!! They don’t care whether you’re a member of the ADA, the ABC, or the BBC for that matter. And if it’s three societies or thirty-three societies, they don’t really care. What they want to know is can they connect with you? Because if they don’t feel like they can, they’ll be clicking away to the next Dental Office website just as quickly as you can say “Jack Robinson”. The most popularly visited pages on a Dental Office Website are the “About the Doctor” page and even more importantly the “About the Team” page. These pages need to be easily found from your home page and they must be user friendly. Ideally there’s an “About the Team” button that’s prominent on your home page. As well as having an “About the Team” tab right next to your “Home” tab in your tool bar along the top of your Home Page. Don’t bury the tab for your team fifth or sixth along after the “Dental Conditions” and “Dental Services” tabs. Because every Dental website has the same services and treats the same conditions, so after a while, for the consumer, the dental web pages start looking like the Laundry Detergent aisle at your local supermarket. Here’s what the new patient is looking for. If your Dental Office Website can answer these four things, you’ll go a long long way towards attracting new business to your practice. What do you like to do on weekends and in your spare time? What the new patient is looking for is a point of commonality with you and your team members. Any point that means they can make a connection with you or someone else at your office. You like golf? My husband plays golf. Janice likes spending time with her eight grand children? Where do they live, Janice? Do they live nearby to you? Lastly, have professional photos taken, with action shots in your Office rather than photos that look your passport photo, or worse still, like you’re just about to be charged with something. The public are wanting to connect with you. And it’s really easy for you to help them to do this…. "I Can Do It On My Own." Said No-one Great Ever! You wouldn’t go and have just one piano lesson and expect to play the Brandenburg Concerto straight afterwards? Or even better. You wouldn’t just walk straight up to a Steinway and sit down and expect to play Beethoven’s Fifth without ever having a lesson at all? And in sport it’s exactly the same. Be it golf, tennis, swimming, or ten-pin bowling. When we see a group of people partaking in these sports it’s so easy to see those who’ve been professionally trained compared to those who are trying to teach themselves. The funny thing is, that golf, tennis, swimming, ten-pin bowling and piano playing for the most part, for most of us, are hobbies. They’re things we like to do in our spare time, but their not things we do for a living. And others do them well because they’d rather do these pastimes well than poorly. There’s something magical about watching a squad swimmer carve their way down a swim lane. There’s something gracious to be seen when we watch a trained bowler deliver a perfect strike, or even better, when they capture that difficult spare with pin point accuracy. And of course, at the driving range, the difference between the swing of a single figure golfer and the swing of a weekend hacker is palpable. A business with well taught, well-learned systems compared to a business where nobody seems to be well trained and people keep making things up as they go along? These two types of business are easy to distinguish. But why is it so in business? Why would you chop at a golf ball with a driver and hit it 170 yards when you could learn how to crush that Titleist 260 yards consistently with piercing pinpoint accuracy? Isn’t golf so much more fun when it’s played from the fairway rather than out of the trees? Yet I see businesses out there all the time where they’re obviously making it up themselves as they go along. Last month I wrote about the pub in London that had the Trip Advisor rating way way above the experience that I received. During that meal, I happened to witness the manager discussing a procedure with a staff member who did not want to be told. On the job. And the body language was indicative that the message, whether it was needed or not, was not very well received. I know, as a Dentist, there are Dental Practices out there where the staff are not trained and taught on a regular consistent basis. Now, you wouldn’t want to be on the receiving end as a patient from a Dentist who had not been well trained and properly trained and judged in the intricacies of a detailed cosmetic procedure? And yet, there are Dentists, who seem happy to allow their staff to look after their most valuable assets, their clients, customers and patients, without being consistently trained, and reviewed, and improved. When I mystery shop some Dental Offices I cringe at what I hear and see being passed off as “service” to these poor and deserving customers. And it’s as obvious as the nose on your face, just like when you’re at the bowling alley, that those who are doing it poorly are simply untrained. The way they seem to feel they should be doing it. The thing about golf lessons, and piano lessons and the like, is that once you begin them, you know that regular lessons are the way to improvement. Like I say, sure you can watch golf on TV, read golf books, go to see tournaments and get tips from Golf magazines. And you may get some improvement? But you won’t get the improvement that you really need. And that you would get from having consistent regular lessons. A Dental Coaching Colleague of mine was telling me about a comment from a team member at a Dental Office they work with. When the Coach asked the team member how she’d been going since their previous call, the team member said that she felt like she’d been going backwards. And I know this is because the team member, who I’m told is a dedicated employee, knows that she can be doing better. And wants to do better. And if better is possible, which in all cases, be it golf, piano, or Dentistry, why not invest in it? The Australian Open Tennis is being played this week. And what you will always see, when watching matches on TV, is you’ll see the camera pan to the coaches’ box. And there’ll be coaches there. A tennis professional knows that if he is to get better, or if he is to maintain his acquired level of competency, he needs to have the right coaching staff there to make sure he delivers. Yet in Dentistry I see very little coaching. I just see winging it. And we’re not talking about a hobby here. We’re talking about a business. Why would you allow your business to blunder on without proper regular training? For a professional tennis player, coaching is an investment. The trouble is most Dentists see coaching as an expense. And the beauty of an investment? Are You Wowing Your Patients Enough? I’m an advocate for always providing World Class Customer Service in the Dental Office. In fact, I’m so fanatical about it, I’m almost an evangelist, when it comes to Secret Service. This is because one of the key things that differentiates an Ultimate Patient Experience Dental Office from other Dental Practices is its ability to discretely gather and utilise Secret Service Information about its clients, customers and patients. So it came as quite a surprise to me yesterday that I was the beneficiary of some Secret Service Information gathered about me by a company that I’ve been doing regular business with. In fact, I was shocked. Because I never in my wildest dreams expected this sort of service and attention to detail from this company. The feeling I felt was the same feeling we all feel when somebody performs a Random Act of Kindness towards us. Because these acts are usually so few and far between. And Random Acts of Kindness are easy to perform as well. It’s only a simple matter of having our radars on and our antennas up looking out for opportunities. Just last week I went up to get some barbeque chicken for my son. As I approached the shop, a woman in a hurry entered from the other direction. The shop was packed. Now a few months ago the chicken shop implemented a ticket system to establish some order for its clients. As I reached and took my ticket the woman who had just entered before me realised that she had not taken a ticket, and turned to the machine. I instinctively handed her my ticket. And what she also was, was that she was surprised to be the recipient of this Act of Courtesy from me. Because in today’s fast paced environment, everybody is conditioned to becoming a queue jumper. Pushing in to get ahead is just the norm. There’s been many a time, in other queues, where I’ve been in that woman’s shoes, so to speak. Where I’ve not been quite alert, and others have one-upped me and jumped the queue. The look of surprise on the face of this woman when I gave her that ticket? How did I feel about performing this Random Act of Kindness that could possibly have made her day? Are you looking for ways of performing Random Acts of Kindness for your clients, customers and patients in your Dental Office? Because dentistry is considered a “Grudge Buy” by so many, like buying new tyres, it is so easy at the Dental Office to make a difference to someone’s day by being different and acting kindly in an unexpected way. And that’s what Secret Service is used for. We consistently attempt to exceed the client’s expectations and to make the client feel welcome, and important. So let me tell you what happened to me. As you know, I’ve been away on a five-week overseas family vacation. And what do you return to when you come home? Long grass, a green pool, and a mountain of mail. Boxes and boxes and envelopes and packages. Boxes of supplements, CD and DVD information products, and books from Amazon. Big boxes containing many books. And small boxes containing single books. As I worked my way through the packages there was one there from The Newsletter Pro, a Company I use to send a physical newsletter once a month to the addresses of Dentists who receive my email correspondence as well. And they occasionally send me things. But when I opened this package I was totally in awe! There were two sincere handwritten notes from Nicole and Rachel, two of the wonderful people that I deal with there wishing me and my wife a Happy Silver Wedding Anniversary, which we celebrated last month. And there was a book. Now I know I’d mentioned in one of my calls with them for content for my newsletter that I was celebrating my wedding anniversary, but I never in my wildest dreams expected any recognition from them, let alone receive a gift? And that’s because they’re business. This is what your patients will feel when you use Secret Service Systems to gather information about them and surprise them when they least expect it. And it does feel good. Better than good, it feels great! The book was the icing on the cake. The book they chose was an early edition Coffee Table quality book about our favourite restaurant. Now I’m thinking, I must have mentioned this to either Rachel or Nicole, yet I don’t recall. Because how would they have known? And that’s the feeling that you want your patients to feel when you and your team use Secret Service Systems to Make Their Day. Because everybody loves a surprise! I’ve been reading a book over the past three days that I highly recommend to any and every small business owner. It’s such a good book and such a good read that I have not been able to put the book down. The book is called ReWork: Change the Way You Work Forever and it’s written by Jason Fried and David Heinemeier Hansson, the Founders of 37signals. I highly recommend this book and I also recommend subscribing to their blog, Signal vs. Noise. One section, which I’ve highlighted and copied below, is applicable to all businesses and to all sections of business. I particularly like the section’s viewpoint with regard to marketing. As I was reading this section I could not help but relate it back to Customer Service. It’s as relevant to Customer Service as it is to Marketing. Because Customer Service is Marketing. Serving the Customer, making their visit to your Office, to your website, to your Business a memorable *EXPERIENCE*, is indeed *THE BEST* way of marketing your business. Because if people like what you do for them, if they love the way you make them feel when they visit your business, they will become advocates, raving advocates for whatever it is you have to sell. In Dentistry, and in all businesses, there’s a belief out there that Customer Service is *NOT* the responsibility of every employee. There’s the belief that Customer Service is only the responsibility of *SOME* employees and not all. Customer Service is the responsibility of every employee. And its presence and existence needs to be addressed at all times by everybody working in your organisation. Nobody in your organisation is exempt. Everyone must know, as my friend Shep Hyken says, that they are employed to do two things: To do the job that they’ve been hired to do and to look after the needs of the customers of that business. No matter what those needs may be. When we compartmentalise our Dental Office, and allow employees to opt out of Customer Service and to opt out of Marketing the business to every client, customer and patient, then we allow those employees to figuratively start tearing up greenbacks. Dollars that belong to our office. Because by their actions of selectively opting out of Customer Service, they’ve basically begun to say to the world that they are going to selectively start ignoring the customers. Sometimes this act of ignoring is simply because the employees involved have not been trained and educated in the necessity of being Customer focused. It’s not that they choose not to be attentive to the customer. It’s that they simply haven’t been educated and trained to be alert to the benefits of providing the customer, the patient, with an experience that’s more than they would ever have expected! So as you read the book excerpt below, when you see the word “marketing”, make sure you see the words “Customer Service” there as well. – Every time you answer the phone, it’s marketing. – Every time you send an e-mail, it’s marketing. – Every time someone uses your product, it’s marketing. – Every word you write on your Web site is marketing. – If you build software, every error message is marketing. – If you’re in the restaurant business, the after-dinner mint is marketing. – If you’re in the retail business, the checkout counter is marketing. – If you’re in a service business, your invoice is marketing. Customer Service in Dentistry is not just a few individual events. Customer Service, in every business, is the Sum Total of Everything we do.